Radio galaxies are recognizable by their enormous jets and lobes of radiating plasma, driven outwards at nearly the speed of light by supermassive black holes harbored in galaxy cores. Pretty amazing right? But I wouldn't want to get anywhere near one. 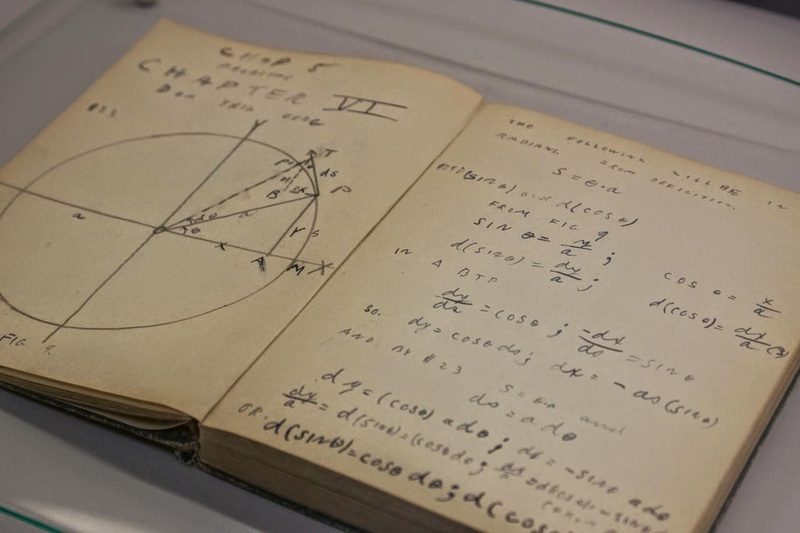 The Niels Bohr Library and Archive opened its doors last month to show off some of its hidden gems. In addition to its exhaustive book, photographic and oral history collections, the library hosts a repository of a range of old physics documents and artifacts. Much of what it stores are the historical documents of the American Physical Society, the American Institute of Physics and some of its member societies. But hidden amongst board meeting minutes and old society declarations are some real treasures. My father and I went to Macy’s and he bought me a book, CALCULUS MADE EASY, and I took it home and studied it and wrote a notebook which I still have, and can give you, of this book, that tells me the stuff in it. That was a way to try to get it into my head this time, instead of forgetting it. So I had learned calculus. Simulation assesses odds of intercepting interstellar communications. It may the biggest and oldest question in science: Are we alone in the universe? If the answer is no, a second question arises: Who else is out there? Such questions have motivated a decades-long search for radio and light signals from intelligent beings on other planets. In a recent paper, Duncan Forgan, an astronomer at the University of St. Andrews in Scotland, analyzed how likely we are to intercept light beams sent between advanced civilizations in our galaxy. The short answer is: not very likely. Humans have a long (and fascinating) history of climbing, and the history of climbing-specific gear is nearly as long. Ropes, harnesses, pitons, and ascenders all help climbers safely reach new vertical heights. Now there's a new technology on the block. 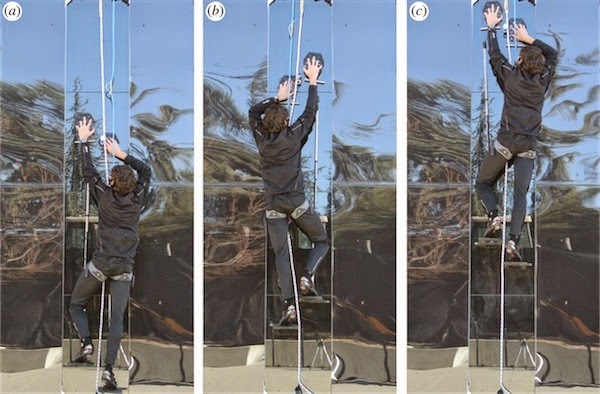 A team of Stanford engineers and physicists has created a gecko-inspired climbing apparatus that gives humans the ability to climb glass walls like never before. Stanford engineer, Elliot Hawkes, climbs a smooth wall using gecko-inspired pads. Credit: Reproduced with permission from Hawkes et. al. 2014. Anyone who has ever carried a tray full of pint glasses without getting their feet wet knows that such a feat is hard work, but perhaps our sympathies should go out to the baristas in coffee shops instead. New research has concluded that carrying coffee without spilling is harder than beer since the foam on the surface of beer dampens sloshing. A team of physicists at Princeton and NYU Polytechnic School of Engineering set up an experiment which jolts three identical pint glasses carrying Guinness, Heineken, and black coffee, and measures the resulting oscillations. This video is the team's entry to the annual APS Gallery of Fluid Motion competition and explains their whole analysis. 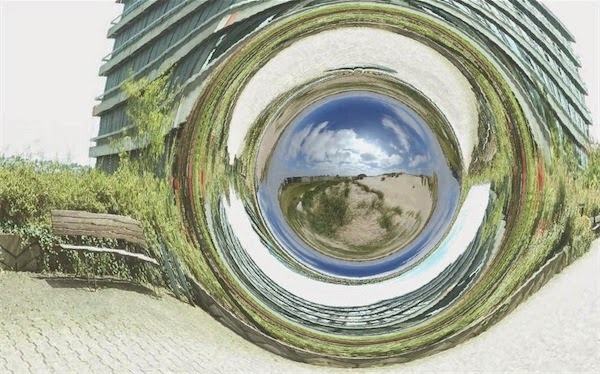 What does a journey through a wormhole actually look like? Let's talk about wormholes. I won't be spoiling anything to say that the plot of Christopher Nolan's latest film, Interstellar, hinges on the existence of a large wormhole allowing intrepid astronauts to travel through in search of new worlds to colonize. In the film, the wormhole is basically just a deus ex machina — a simple plot device to get the main characters out into deep space. Nevertheless the film's brief depiction of this theoretical concept left me intrigued to know what a trip through a real wormhole might actually be like. What do earthquakes, the moon, and the earth’s magnetic field have in common? They’re all connected to the iron core deep inside our planet. On this week's podcast, join me on a journey to the center of the earth. First, Planetary Science Professor Raymond Jeanloz from the University of California Berkeley will guide us through the iron catastrophe, the event that formed the earth’s core. Surprisingly, it has a lot of do with the planetary impact that chipped the moon from early earth. 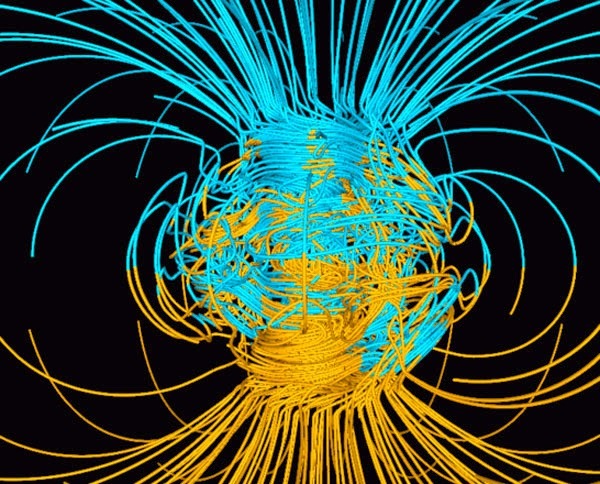 A simulation of the magnetic field created by liquid convection in the earth's core. Image Credit: Dr. Gary A. Glatzmaier/Los Alamos National Laboratory/U.S. Department of Energy. Then, Professor Jennifer Jackson at Caltech’s Seismological Laboratory will tell us how scientists study the core. Because the core is 4,000 miles down, and the deepest humans have drilled is only seven anda half miles, scientists use indirect methods to study the core. We’ll find out how studying the deep rumblings of earthquakes provides details about the material that makes up the core and how scientist sare recreating more than 3.6 million atmospheres of pressure in the lab. Finally, Jeanloz will hint at happenings in the core that might flip our world upside down. 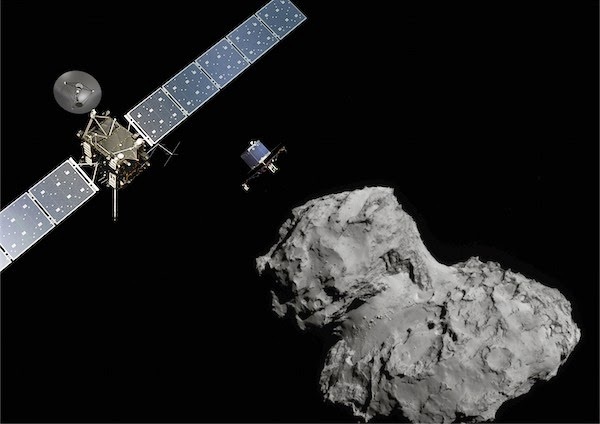 History will be made when Rosetta's lander Philae makes a soft touchdown on a comet tomorrow. ESA's Rosetta spacecraft first captured the world's imagination back in January when it reawakened from hibernation, and tomorrow's landing will mark the crowning achievement in an already scientifically-rewarding mission. 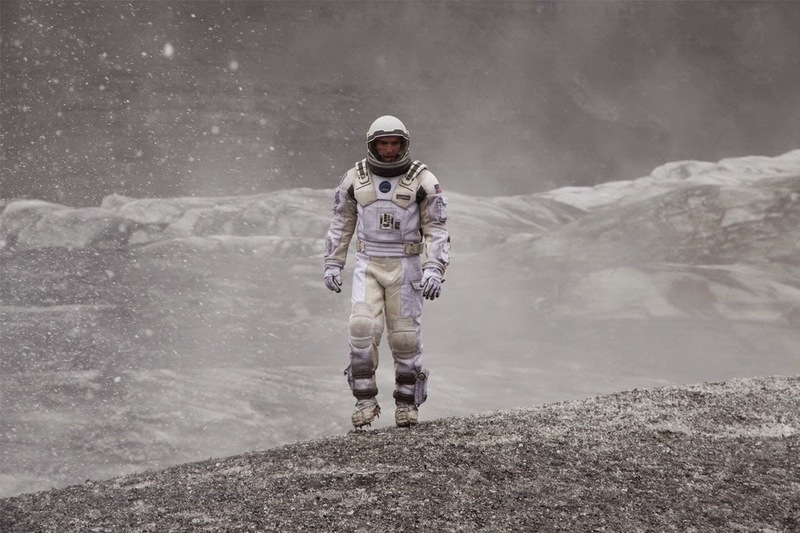 Christopher Nolan's new space epic Interstellar opened in theaters late last week. The film follows a team of intrepid astronauts in the not too distant future as they traverse a wormhole to the distant corners of the universe. They navigate black holes and hostile planets in a desperate attempt save the people of Earth from an all consuming, planet-wide dust bowl. Matthew McConaughey as astronaut Cooper, exploring a frigid planet surface. Image: Paramount. Legendary physicist Kip Thorne of Caltech was the science advisor and wrote one of the earliest treatments of the movie. General relativity and its weird effects like time dilation, warped space and gravitational singularities are integral to the plot, and we'll have a full rundown of the physics of it all soon. Maybe it's cold in your neighborhood, but that doesn't mean the planet isn't warming over all. It's a little like standing on top of a small hill, and just because you're the highest thing around as far as you can see, assuming you've climbed to the top of the tallest mountain in the world. That would be true for precisely one spot - the peak of Mount Everest. So if you want to know how climate change is affecting the world, don't just look out your window. Do a little research. Unfortunately, as you will see in the Inside Science video below, too many people are using local conditions to decide how to act on issues that have global effects. Tomorrow a new film which chronicles the personal life of astrophysicist Stephen Hawking is released to US audiences. The Theory of Everything is an adaptation of a memoir by Hawking's first wife, Jane Wilde, and centers around their time together in Cambridge during the 1960s as Hawking begins his PhD research and struggles against the onset of ALS (i.e. Lou Gehrig's disease). 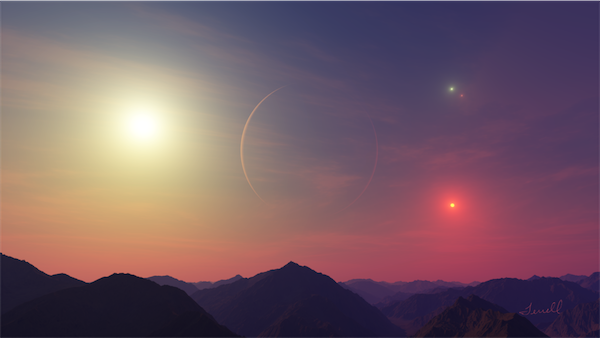 What would life be like on a planet with six suns? What if darkness only fell once every 2000 years due to the complex orbits of this fictional solar system? Would the people go mad? (Inside Science) -- Researchers around the world are studying how to destroy chemical and biological warfare agents without anyone getting hurt. A research group at the University of California, San Diego has demonstrated the ability to destroy dangerous agents, such as nerve gas and anthrax spores, with a recent new invention: self-propelled micromotors. Micromotors can act as tiny nanotorpedoes that propel themselves through fluids using chemical energy. Ordinary micromotors consist of double layers of iron and platinum rolled up into tubular structures. If a dangerous agent was detected in a liquid, scientists and decontamination crews could add the motors to that liquid, along with the chemical that serves as their fuel, hydrogen peroxide. The peroxide reacts with iron within the motors, and through a series of reactions also involving water, produces a jet of oxygen bubbles that propel the micromotor in a whirling motion. The tube is coated on the outside with a catalyst or active chemical compound that destroys the dangerous agents. Because of their stirring action the decontamination rate is much higher.